As you guys know, we’ve been rooting for a stock market crash for most of October. When we’re shorting stocks, we want the market to drop as fast as possible so we can make a profit. You may not like the repercussions of a severe market correction, but since there is nothing we can do to prevent it, all we can do is try and profit from it. Innocent people’s portfolios will get slashed under those circumstances, companies will shut down and people will likely lose their jobs. An economic recession may even follow. We have no idea and no say in the matter anyway. So we’ve had two options in October: Close our eyes and ignore it? Or prepare and profit? We’ve chosen the latter. In case you’re wondering, we’re still rooting for a complete collapse in U.S. Stocks. The only thing that would make us more neutral is the Russell2000 Index Fund $IWM holding above 151. Under those circumstances and more neutral approach towards equities is best. In the meantime, we’ll keep pressing shorts and hoping for the worst. Today, I want to bring up two charts that I believe are pointing to further selling. I could even argue that these are the most important charts in America right now. We’re talking Credit Spreads. 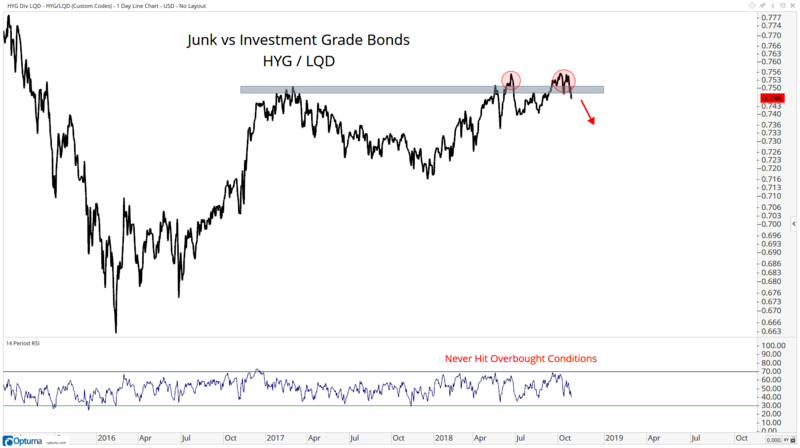 When institutional money wants to be aggressive, they position themselves into riskier, higher yielding junk bonds at a faster rate than they do into more conservative, lower yielding U.S. Treasury Bonds. 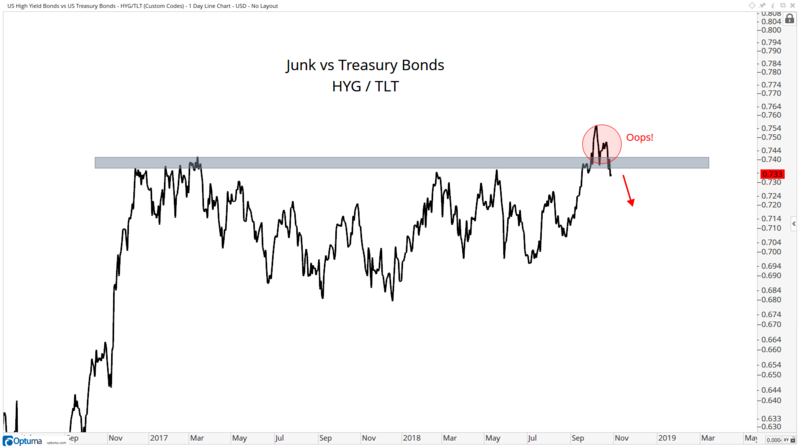 If there is stress and they need to be getting more defensive, you’ll see that flow into Treasuries at a much faster rate than into riskier Junk. I added a 14-day RSI below to show that on these rallies, momentum could not even get overbought. This is characteristic of a downtrend, not an uptrend. The weakness here is very clear. If we don’t get a miracle recovery back above the early 2017 highs, stocks are incredibly vulnerable and much lower prices are likely. There are a lot of ways to measure stress in credit. We’re watching the CDS in High Yield Bonds for example. The Barclays High Yield Average OAS is another measure. The CDS in Deutsche Bank is probably another important one to keep an eye on. 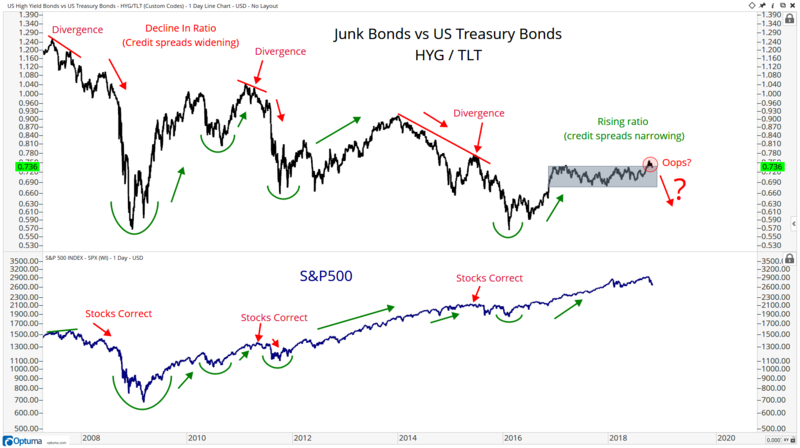 Either way, bonds are where the big boys play. Every crypto currency in the world can go to zero and no one with any money will care. All those pot stocks can drop to zero tomorrow and it won’t matter. These institutions are too big to play in the little kid sand box. If we want to know how real money is flowing in and out of real assets, we need to watch the biggest market of them all: Bonds. Make sure you’re on our Premium list so you receive regular updates on these charts.